Beware The Twist! Bill Clinton Plans To Pen A Thriller With James Patterson : The Two-Way The former president and fiction titan foisted a surprise on readers Monday, announcing they'll be releasing a novel named The President Is Missing in June 2018. 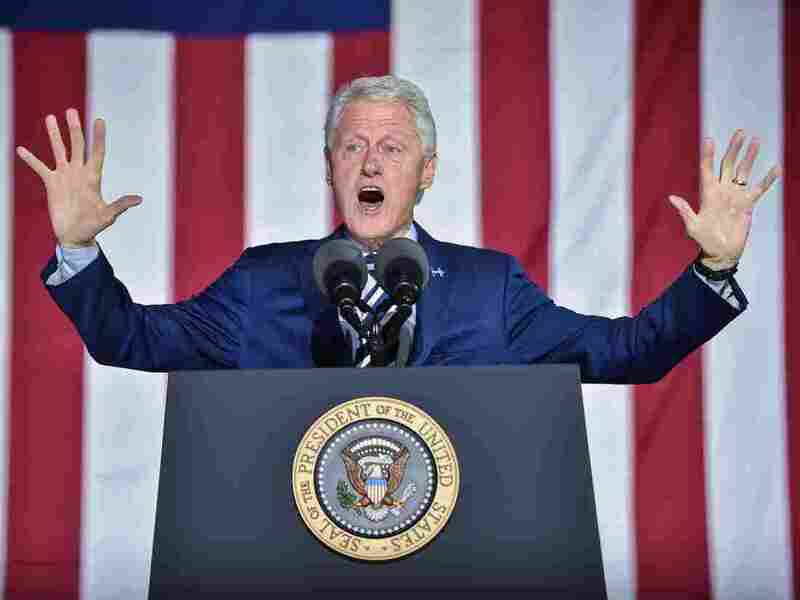 Former President Bill Clinton gestures to the crowd during a campaign stop in Philadelphia for his wife, Hillary, on the day before the 2016 presidential election. James Patterson has a long history of collaboration. Of his dozens of books, the blockbuster thriller writer has written at least 50 — yes, five-zero — with the name of a co-author emblazoned on the cover. Still, it's fair to say none of them has the resume of the fiction novice he's teaming up with now: former President Bill Clinton. "Working with President Clinton has been the highlight of my career, and having access to his first-hand experience has uniquely informed the writing of this novel," Patterson said in a statement released by publisher Penguin Random House. "I'm a story-teller," Patterson continued, "and President Clinton's insight has allowed us to tell a really interesting one. It's a rare combination — readers will be drawn to the suspense, of course, but they'll also be given an inside look into what it's really like to be President." The former president, for his part, said he drew on his experiences in office for the book, called The President Is Missing, naturally. "Working on a book about a sitting President — drawing on what I know about the job, life in the White House, and the way Washington works — has been a lot of fun," Clinton said. "And working with Jim has been terrific. I've been a fan of his for a very long time." Publishers Weekly reports that the book, which will be released in June 2018, came together after Washington, D.C., mega-attorney Robert Barnett — who has represented both men — suggested they collaborate on a project. Clinton and Patterson had already met about a decade ago during a round of golf, according to the news service. Despite Clinton's relative inexperience in fiction, his post-presidential memoir My Life sold over a million copies. It's partly the sales success of both men that their publishers have decided on a rather unusual arrangement. The rivals Alfred A. Knopf, which is Clinton's publisher, and Little, Brown and Co., Patterson's publisher, have agreed to make the forthcoming novel a joint release. That said, the arrangement is not unprecedented — as The Associated Press explains: "A political release from the 1990s had a similar arrangement: Random House and Simon & Schuster jointly published the nonfiction All's Fair by husband-and-wife campaign consultants James Carville and Mary Matalin." Publishers have not released details yet on either the upcoming book's plot or financial arrangements.